In an age when E31s are changing hands for around $10K , would you be willing to spend nearly SIX TIMES that much on a very clean, super rare, M-powered 850CSi? The ad claims that while the car itself has traveled just over 140K miles, the engine was completely rebuilt 27K miles ago. The heater & A/C cores, catalytic converters, coils, caps & rotors, alternator, belts, air & fuel filters, O2 sensors, water pump, alternator, batteries, rear bushings & front control arms have also all been recently replaced, apparently, which would make most of this 21-year-old car essentially new. 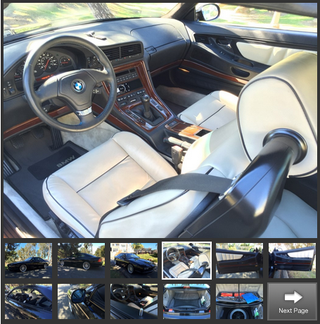 The interior is the cleanest, prettiest, and most modern I’ve ever seen in an 8-Series. Even the leather looks soft and brand-new. All that being said, it’s almost certainly the most expensive 8-Series out there right now. Is the sky-high price worth it, or does it have you passing the crack pipe?